Ellon Flowers can offer a variety of beautiful flower posies and baskets for funerals. Our large variety is sure to hold something which suits every taste and add style and grace to the funeral proceedings. The Ellon florists have over 40 years of experience of in the floristry industry, meaning that our posies and baskets are crafted with skill and care. Our florists take great pride in their work and are able to provide any advice you may need concerning your order. Ellon flower delivery service provides excellent flower deliver of your funeral baskets and posies in Ellon and the local area. As we are part of the Interflora brand we can also deliver to an enormous range of location across the United Kingdom and even abroad in 140 different countries across the globe. Flower posies and baskets add beauty and elegance to any funeral proceeding, which is why they are perfect to commemorate those who have passed away. At Ellon florists we care deeply about providing the best service possible for you, which is why we oversee your order carefully until it has been safely delivered and you are satisfied. Our friendly team would be happy to hear from you if you have any queries or questions, which is why you should not hesitate to get in touch should anything come to mine. Our stunning range of funeral flowers, including baskets and posies, are readily available for your choosing from the florists in Ellon. Our fast and reliable delivery service aims to keep our customers satisfied, as you are deeply valued by us. Ellon flower delivery services are also available to provide same day delivery for products ordered before 3 pm, meaning your funeral flowers can be safely with you as soon as possible. For tasteful and elegant funeral flowers, Ellon Flowers is all you need. Ellon Florists take great pride in their work, and their funeral flowers are no exception. Our range of classic posies and baskets for funerals are sure to please a variety of different tastes. For those looking for classic simplicity, our classic posy including large-headed roses, lilies and freesias is a clear choice. 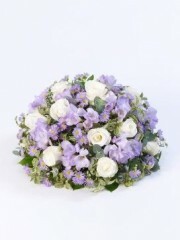 The beautiful colours of the flowers are sure to add a heartfelt touch to the funeral proceedings. We also offer more unique posies such as scented posies, rose and freesia posies and woodland posies. All of these are great choices to add grace and elegance to a funeral. Flowers are a wonderful way to add beauty to any occasion, and funeral flowers are no different. Here in Ellon our florists carefully craft the posies and baskets we provide for funerals to the highest standard. We also offer mixed baskets of fresh flowers in different colours, namely pink and lilac or yellow and white. These simple yet elegant baskets are delivered efficiently by our flower delivery service in Ellon. You should have no doubts in trusting the florists in Ellon with your funeral flowers, as we will treat them with the utmost care. We recognise that funerals are a difficult time, which is why we aim to make your order from Flowers Ellon as easy as possible. The Ellon florists will provide a range of funeral flowers, and our posies and baskets are a wonderful choice to provide great beauty to commemorate a loved one.